When I come home after work, the first thing I try to do is give my daughter a big hug and ask her if she had a good day at school, at which point she pretty much always answers yes... except today. She didn't really clarify, she only said that "I'm mad because I'm sad, and I'm sad because I'm mad". She was also unamused with her lunch, even though it was one of her favorite things to eat. This sounds like a job for ICE CREAM! and nothing is more comforting than CHOCOLATE ICE CREAM!! To the freezer to unwrap a fresh container of Ben & Jerry's Light Phish Food. Sure it's light, but it's B&Js right? well, there is one thing that makes me wonder. There are 6 froyo flavors, but only 3 light flavors? and I see froyo way more often than I see light. That's not exactly what we call a "good sign". No matter! my daughter needs chocolate ice cream and she needs it now. I tell her it has little fudgy fish inside and I think I see a smile. We don't have a lot since it's dinner time, but it's more than enough to make up my mind, and my mind says I'm not impressed. The fudge fish are fine, the marshmallow swirl is....oh man, I can't think of the word...there's lots of it, and it's fresh...actually, reminds me of those chocolate covered marshmallow bunnies you can buy. The caramel is there, though it's staying out of the limelight. My problem? the light chocolate ice cream, I'm not loving the texture or the taste. I'm not saying it's awful, I just wasn't expecting what I discovered. This one's definitely going to need a second scoop now that my expectations have been lowered. At least my daughter was happier and back to running around the house. On Second Scoop: I don't know if it was really fair to review this flavor without having had regular Phish Food. I mean, this is good, and a devoured a nice bowl of it yesterday, but it just seems a bit off to me, like the chocolate is too strong or something. I'm also still impressed by the big fluffy swirls of marshmallow...maybe they are distracting me as well. I couldn't disagree more. I absolutely adore Light Phish Food & it's really the only dessert that I eat daily. Alas, Ben & Jerry's discontinued it a few weeks ago & I'm at a loss. Their FroYo substitute is awful (imho) & I don't work out enough to do ice cream. I am truly sad about this development. 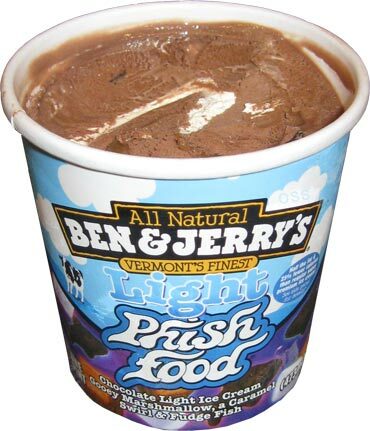 If anyone else feels as I do, PLEASE write to Ben & Jerry's (on their website) and plead with them to bring back LIGHT Phish Food!